I've had several emails asking what I did for Kishi to make her more comfortable. I don't want to say that she's cured. She's far from it. But she has hair finally. And looking at photos from 2 years ago, I'd say she's improved. It hasn't been an easy road with Kishi that's for sure. But here are some of the things that I did over the course of a couple years that helped Kishi back from where she was to now. As long as I keep doing what I've been doing I keep seeing improvements. I've kind of picked up on all of this by trial and error. Some things were with my vets approval and some were not... I don't want to make any claims that one thing might work on someone else's dog... so what I've written here is what I did for my dog to make her feel better. Check with your vet if you have questions or concerns before trying any of these steps. I feed Kishi a raw meat diet with absolutely no grains. There are many pre-made raw diets the market - you have to find one that works with your dog- I do switch around because I believe allergy dogs can become allergic to something given to them over and over. So every few months I switch to a different protein source. Plus, how many dogs get to live their life eating veal, lamb, buffalo, rabbit and venison. That makes Miss Kishi a pretty special dog. She also gets a 1/4 cup of yogurt with her meal. And a hard boiled egg in the shell twice a week. And because of feeding her raw meat I worm her every 2-3 months with Panacur-C. She does remarkably well immediately after the worming. Make sure they don't have fleas. I use Advantage, but only if I notice fleas. I don't use it regularly. I bathe her in full strength Selsun Blue 2-3 x per week. When she's doing better this drops down to 1x per week or sometimes even less than that. I leave the Selsun Blue on her skin for 10 minutes before rinsing. AND I don't let her lick any of the shampoo for the fear that it might make her sick. I removed all the carpet in the areas that Kishi hangs out. I believe she reacted to the chemicals that my professional carpet cleaners used on my carpets. She immediately improved and hair began growing on her stomach once the carpet was gone. Her initial allergic reaction was days after a vacination AND having my carpets cleaned. We moved, she got better. I had the carpets cleaned in the new house. She got worse. I removed the carpet, she got better. I took her off of all medication except Thryroid medication. That's the hardest thing to do because it's against what my vet suggested, but I really believe that is what she needed. So no more antibiotics, steriods, etc. After making the decision not to continue giving her medications, I used Nzymes to help her recover from her yeast infections. I used two of their yeast kits and then I've just kept her on their Antioxidants ever since. When I first started using it on her, she got worse just like they said on their website, and then slowly started to get better. I do not vaccinate her - she stays inside and is rarely exposed to dogs other than my own. All of her problems started after a vaccination reaction. If she starts to chew on herself, she wears a cone to prevent chewing. I bought the Bonafido Soft_E_Collar... I don't like it for shibas because it's too heavy and because their neck is larger than their head they can duck and pull out of it like they do with collars. So stick with a regular cheap plastic cone. Tomlyn Allercaine with Bittran II sprayed on her between baths when she starts to itch. It really works to kill the itch. She doesn't like it when I first spray it on her, so it must sting a little. But she gets over it fast and is much more comfortable. I will also use Gold Bond powder on her to keep her dry. Just make sure the dog doesn't lick the powder. It's medicated and I don't know if it would make them sick. So I keep her cone on her when I powder her. The idea is that her skin MUST stay dry or the infections start up again, and so does the chewing. The vets kept giving me medicated lotions to use on her. They never worked because they didn't allow her skin to dry out. I think that's it... although there are many other products that I tried that I didn't list because they didn't make a difference with Kishi. Like I said, I don't think it was just one product or one thing that helped. It was a combination of all of them. It's been awhile since I did an update on Kishi. 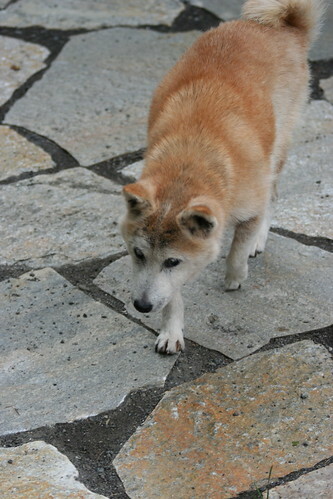 Kishi is my oldest dog with allergies and a variety of other health problems. 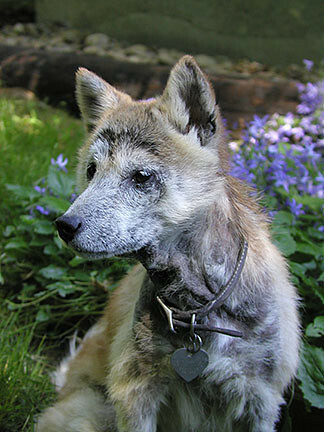 For several years her allergies were so severe that she looked more like the shiba version of a Chinese Crested. Seeing the photo of her from a couple years ago allows you to appreciate that she is now sporting a beautiful shiba-orange coat in the middle of summer. I can't exactly tell you that one individual thing or product worked for her. I can give you a list of things that I did consistently that brought her from the first photo to now (the second photo). I won't make the claim that one product fixed her problems. I really believe it was a combination of all things I tried and time away from all the medications that the vets had prescribed for her over the years that brought her health back. It has been a long, long road. I'm so happy she has a little comfort in her senior years. She's a great dog. She deserves as many healthy days/months/years as she can get. After a long trip this summer that was totally dog-free, it's nice to be back home with my puppies. Speaking of, the real puppy, Trixie, has really grown up. She almost doesn't look like a puppy anymore. We've been working with her on the agility equipment. J is planning on training her and eventually competing with her. 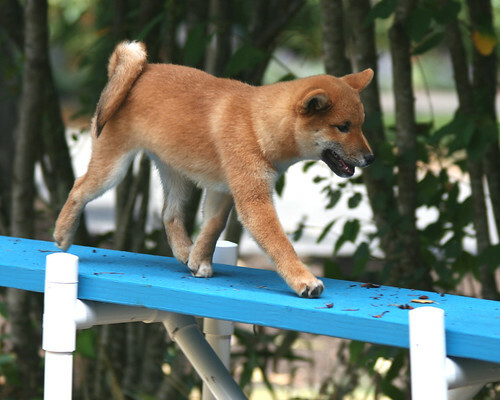 She's fearless - like most shibas. Dog walk, A frame, teeter - not a bit of fear. I wish a little of that would rub off on teeter-scared Timber. Timber is almost ready to start trialing. We just have to work on our flow between the obstacles, better communication and of course the teeter. And wait a couple more months until he is 18 months.